Blog | Blog | Does My Child Have A Sore Throat Or A Strep Throat? Does My Child Have A Sore Throat Or A Strep Throat? It is one of the things that parents dread. But at some point, your son or daughter will have a sore throat. While you wish you could just instantly take away their pain, that is not an option. However, what you can do is focus your efforts on helping your child feel better as soon as possible. But since the soreness that your child is experiencing in his or her throat is the symptom of a larger problem, it is important to determine the specific cause of the throat pain in order to treat it most effectively and be most helpful to your child. That makes it critical for you to know whether you are dealing with a sore throat or a strep throat. While sore throats are most commonly developed when your child contracts a cold or the flu, strep throats are the result of a bacterial infection. Medications can improve a strep throat, but they can be highly contagious and can lead to other issues. A sore throat in many cases is the first indication of a cold, and if that is what your child is contending with, then the throat pain can improve within 1-2 days. If your child’s throat is the result of a cold, then other symptoms that might be involved with this virus can include scratchiness in the throat, and redness in the back of his or her mouth, along with congestion, a runny nose, coughing, body aches, headaches, and a fever. Once you are sure that your child is experiencing a sore throat as opposed to a strep throat, you can have your son or daughter sip warm liquids to combat the pain and scratchiness in the throat, or give your child cold and frozen liquids. Gargling with salt water can also improve the situation, while throat lozenges and hard candy are also beneficial. Over-the-counter pain relievers can also help your child until the virus that is causing the sore throat has subsided. Strep throats are caused by bacterial infections and are passed from one person to another through sneezing and saliva. However, these bacteria can also be spread by touching a doorknob or other surface that has been contaminated, or by sharing drinking glasses or utensils. This is most likely to occur for anyone between 5-15 years of age, although adults can also contract a strep throat. Swollen lymph nodes in the neck, high fever (102 degrees or higher for children) and white spots within the throat area, and red spots on the back roof of the mouth are all signs of a strep throat. Strep throat is less common in infants than in children who are of school-age, but that does not mean that an infant cannot develop strep throat. Symptoms that can occur for infants with a strep throat include fever, irritability, sleeplessness, swollen neck glands, and either a red throat or tonsils. If your infant refuses to breastfeed or drink from a bottle, this could also be an indication that strep throat is present. If you are concerned about a strep infection and have yet to have received any diagnosis from a doctor, remember that washing your hands is the best way to prevent infection. 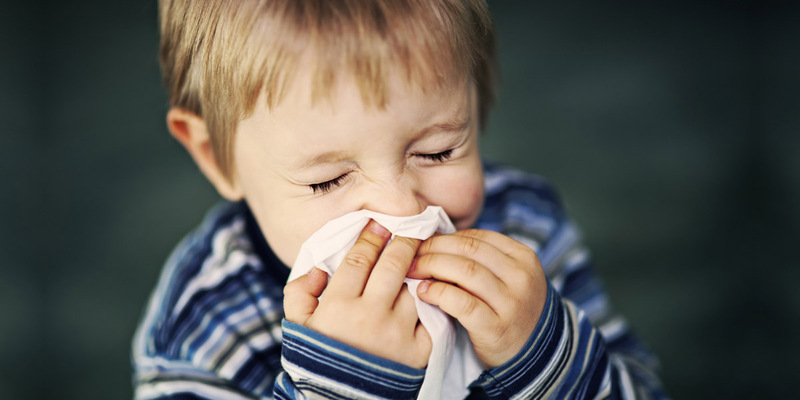 Having your children cover their mouths when they cough or sneeze is also highly recommended. Finally, as you avoid using the same utensils or drinking from the same glasses, you can also replace any toothbrush that has been used when your child is combating a case of strep throat. First, if your child is having any difficulty breathing or swallowing, then immediate medical attention is necessary. This is also true for a fever of 102 degrees that is not being lowered after your child has taken acetaminophen or ibuprofen. Otherwise, once you do visit a physician, you should make sure that you provide every detail of what has occurred with your child so that the doctor can make a proper diagnosis. You will likely be asked whether or not the symptoms have changed, and if your child may have been exposed to someone else who was dealing with a strep throat. The physician can then determine whether strep throat is the culprit behind your child’s pain by sending a throat swab to a laboratory, or by checking a rapid antigen test. The rapid test can indicate whether strep bacteria are present within 5-10 minutes, and usually with great accuracy. However, if the results of this test are negative, and the doctor still believes that strep throat is the issue, then he or she could decide to do a throat culture. A throat culture involves rubbing a sterile swab at the back of the throat and tonsils in order to secure a sample of the area. The culture would then be sent to a laboratory, with the results most likely being available within several days. If the tests do not reveal the presence of a strep throat, the best plan of action is to focus on treating the symptoms with the suggestions that were listed previously until the virus has run its course. However, if the diagnosis is strep throat, antibiotics can effectively kill the bacteria that causes this problem. In many cases, doctors will prescribe penicillin or amoxicillin which will relieve the sore throat pain, help your child overcome the strep throat more quickly, and reduce the chances that it will be spread to you or anyone else. Antibiotics will also help avoid the situation from becoming worse by expanding into a sinus and tonsil infection. If your son or daughter is allergic to penicillin, there are other antibiotics that the physician can prescribe. If a physician has determined that your child does have a case of strep throat, and has prescribed an antibiotic, your son or daughter should not return to school until at least 24 hours have passed since the first antibiotic has been taken. In some cases, your child might require an additional day or two before they have recovered sufficiently for a return to school. If you have any questions or concerns about sore throats, strep throats, or any other health issues that you may be facing with your child, they can be addressed by contacting or visiting an urgent care center such as Rapid Med Urgent Care Center. We understand that your child’s health and your personal peace-of-mind are both extremely important. There is a reason that we are called Rapid Med Urgent Care Center and we make your comfort and care our top priority from the moment that you visit us. We also provide you with the option of discussing your problems or concerns simply by contacting us through our On Demand service.